Vin Scully of the Dodgers by Stephen Holland. The Art Of the Game is thrilled to announce the release, of the first and only official signed limited edition portrait of the voice of the Dodgers, Vin Scully. For 64 seasons and counting, there has barely been a moment of Dodger history that has not been described to the world by this one man. From his perch high above home-plate, the spoken sound-track that fills the memories of generations, radiated out to the furthest bleacher, squeaked and rattled from transistor radios spotting the crowd and made a game come to life for a kid riding in the back seat of his dad's car on the 110. 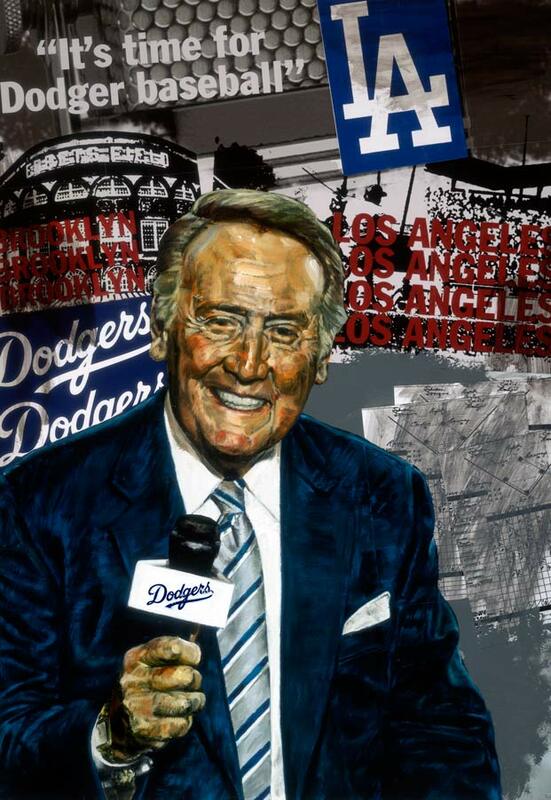 Artist Stephen Holland has lived up to his role as the Dodgers artist, by creating a portrait that captures the legendary importance of Vin Scully. In one fantastic work of art Holland has described the epic period of Dodger history in which Scully's on going career has covered. Holland has placed Scully center stage between Ebbets field in Brooklyn where he started on his left and LA's own Dodger Stadium to his right. And in his hand Holland has placed the microphone with the Dodgers insignia, held as his own royal scepter, just as he has through seven decades.